Intro students at lab setup time at dusk. at the old observing facility on Rankin Science building. The new facility will be in operaton Fall, 2005. 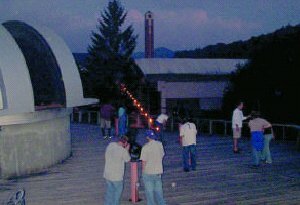 The Department of Physics and Astronomy at Appalachian State University offers a BS degree in Applied Physics with a concentration in astronomy For the undergraduate degree, in addition to the basic required physics courses, the student will take courses in introductory astronomy, observational astronomy techniques, astrophysics, and celestial mechanics. The astronomy concentration is designed to provide a strong background in physics, astronomy, and mathematics. In addition, the student will gain skills in computing, image processing, data acquisition, and electronics. The astronomy program emphasizes optical observations and makes use of the observatory's two facilities. The on-campus Rankin Science Observatory (RSO) is located on the roof of the Rankin Science building and is used by students in the Introductory Astronomy and Observational Astronomy courses, as well as for work in senior seminar . The new GoTo Lab Facility will offer Meade 10-inch GoTo telescopes, with STV Intensified CCDs. Advanced students use the new DFM Engineering 16- inch telescope in the dome, with SBIG CCD and SBIG spectrograph.